Pneumatic retinopexy is a procedure that can be performed in the office to repair a retinal detachment. It is an alternative to scleral buckling and vitrectomy surgery. The procedure involves placing a small amount of medical grade gas in the eye. The gas forms a bubble that will be used to close the retinal hole or tear, which has caused the detachment. It is combined with laser or cryotherapy to form a seal around the defect in the retina. 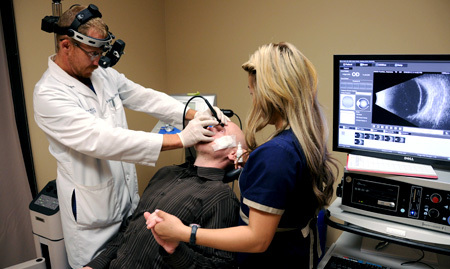 After the gas bubble is injected, the patient is instructed to hold his head in a certain position to “keep the bubble on the trouble.” This prevents fluid from passing through the retinal defect, allowing the detachment to resolve. The intravitreal gas spontaneously dissolves several weeks after its placement, at which time the retina is hopefully permanently reattached. Maintaining the proper positioning, following surgery, is crucial to the healing process. Some patients may experience slight discomfort that can be alleviated with ice packs and over-the-counter-pain medication. The gas bubble that is injected actually expands in the eye; you will see it in your lower field of vision. While the bubble is present, patients are not permitted to travel by air or go to high altitudes. Changes in air pressure may cause the bubble to expand, increasing pressure inside the eye. Not all patients are candidates for this procedure; your doctor will help determine what is best for you.